Former Phillies and Blue Jays pitcher Roy Halladay will be inducted into Canada’s Baseball Hall of Fame this summer on June 24. Phillies and Blue Jays alumnus Roy Halladay is a near-guarantee to be a Hall of Famer once he is eligible in 2019. In the meantime, Halladay will be inducted into the Canadian Baseball Hall of Fame along with former Expo, Angel, Ranger, and Oriole Vladimir Guerrero. The Canadian Baseball Hall of Fame is for natives and player who “have done something significant in baseball in Canada” according to its website. Neither Halladay nor Guerrero are natives, but both played many seasons for Canadian teams. Halladay spent 12 years with Toronto and Guerrero spent eight with Montreal. “Toronto has been my home away from home throughout my career and even to this day. My oldest son now 16 was born in Toronto and considers himself Canadian. It was a privilege to live and play in Canada for as long as I did. The people here were kind, supportive, respectful and always seemed to welcome me home even when I came to visit and sat in the wrong dugout. In twelve years with Toronto, Halladay had a 148-76 record with a 3.43 ERA (133 ERA+), 1.198 WHIP, and 3.29 strikeout-to-walk ratio. He won a Cy Young award in 2003 and was in the top five for voting five times. 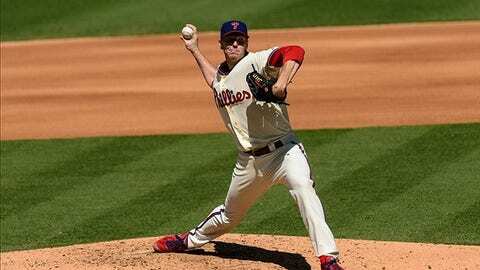 However, I will always remember Halladay for his time in Philadelphia. He came over in a blockbuster trade and then signed a three-year, $60 million extension with Philadelphia. I will always be bitter over the ensuing trade sending Cliff Lee to Seattle and will always wonder what the two could have done together in 2010. Trading for Halladay immediately paid off for Philadelphia in 2010. In 33 starts, he racked up 6.4 rWAR as he led the league in wins (21), complete games (9), shutouts (4), innings (250.2), BB/9 (1.1), and strikeout-to-walk ratio (7.30). On top of those stats, Halladay threw two no-hitters in 2010. The first was a perfect game against the Marlins in May, then he threw a no-hitter in Game One of the NLDS against the Reds. The combination of stats and no-hitters made Halladay the unanimous NL Cy Young winner. Over his 16-year career, Halladay went 203-105 with a 3.38 ERA (131 ERA+), 3.39 FIP, 1.178 WHIP, 3.58 strikeout-to-walk ratio, 20 shutouts, and 67 complete games. He won two Cy Youngs and was an All-Star eight times. Halladay was an easy choice to be inducted into the Canadian Baseball Hall of Fame, and he should be an easy choice to be inducted into Cooperstown come 2019.